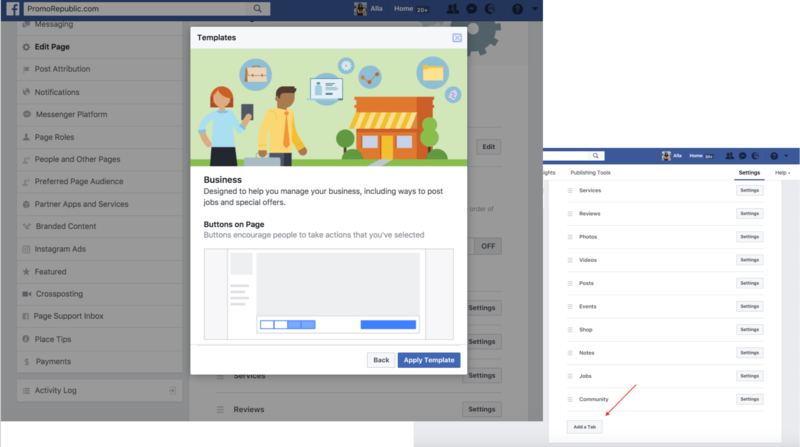 Every Small Business’ main goal should be to sell via Facebook. Whether you are a Brand, Artisan or Personal Coach, this is something you all need to thrive for; to achieve any form of revenue or profit. Big brands can easily settle with basic Social Media presence because their budgets are not comparable to yours. It all comes down to simply publishing posts, attaching the links to your website which then converts into leads and voila! your product/service is sold. In the current state of online shopping, you don’t need an actual website. Now you not only promote your company with Social but also sell directly from Social. 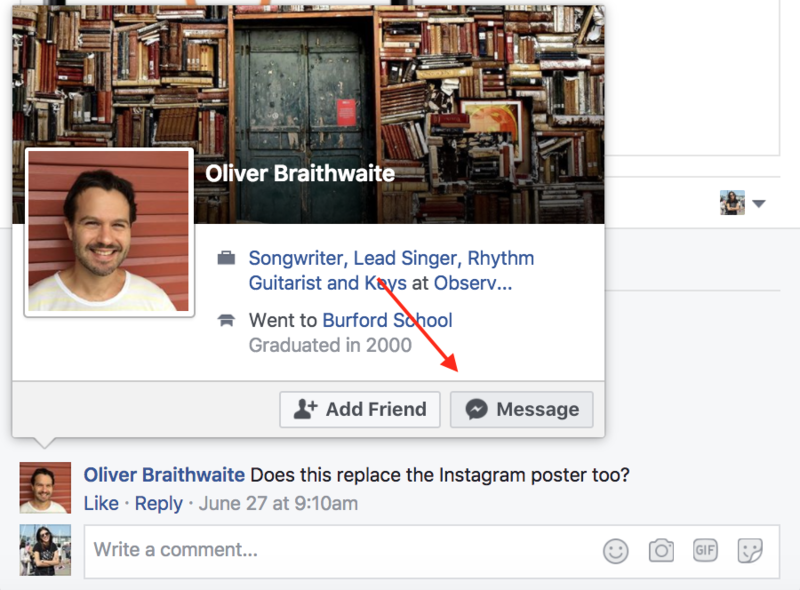 Facebook rolls out new features all the time. You can turn your page into a great market place. But to see results, you need to set it up properly. 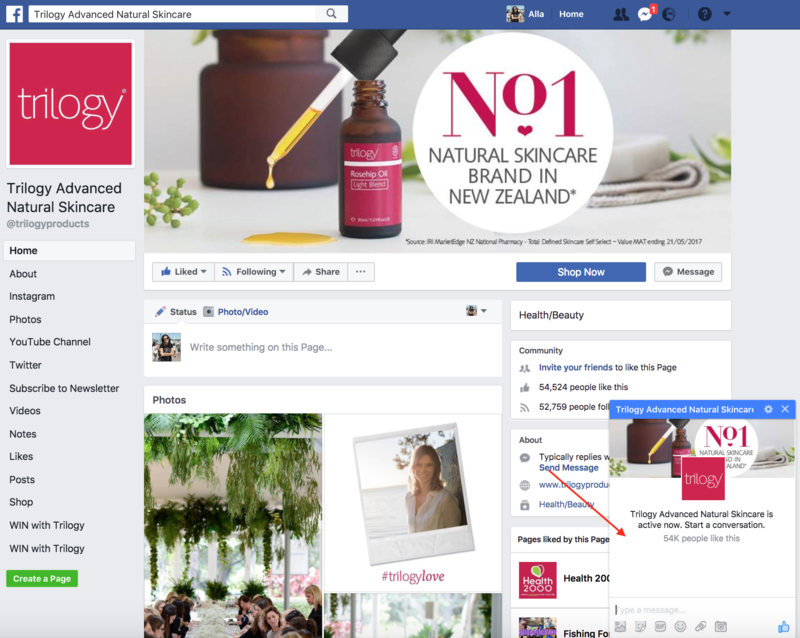 There are some page templates to help you promote your products more effectively. To find them – go to Settings–Edit Page. Before you set up a certain template, make sure you are happy with all its call to action buttons and tabs. 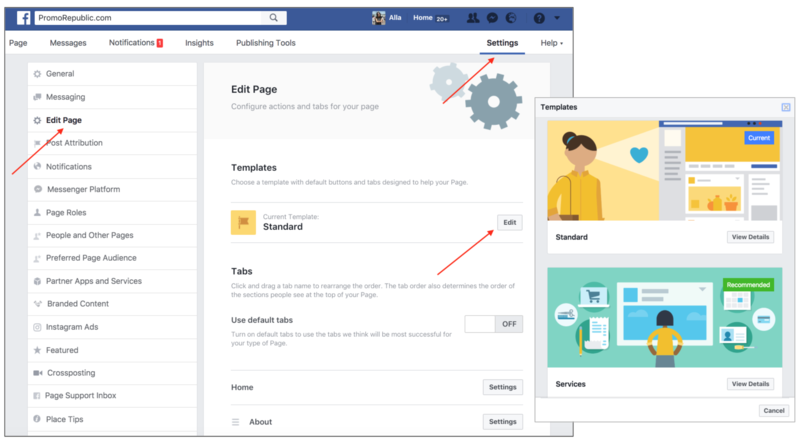 Some page templates do not have tabs that you may need, but you can manually add all those you do. Your call to action button represents the action that you expect them to perform. Whether you want them to shop, learn more, or place an order – make sure your button represents your current objectives. To change your call to action button, click on your page and choose your option. Now you need to decide on the website (if you choose Shop now) or Contact (if you choose Contact Us) that your button will lead to. You can test different call to actions and change them according to your relevant campaigns. You can see statistics on each CTA and promote them. 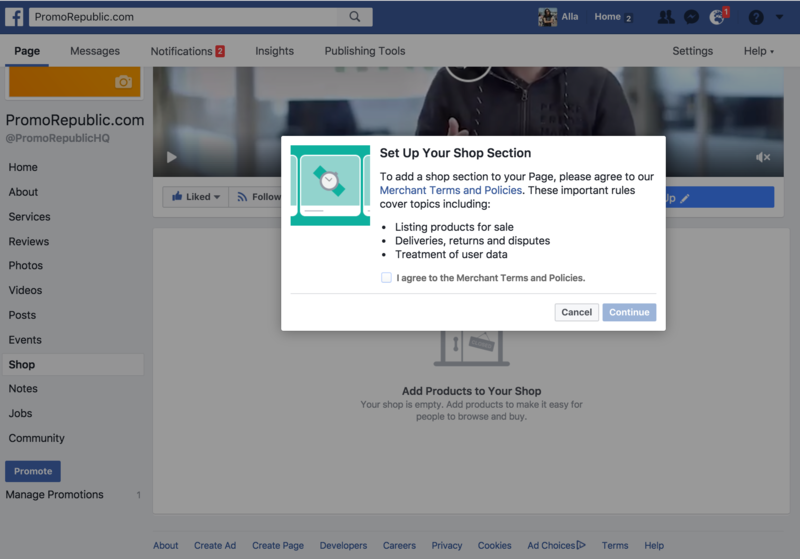 If you want to sell products directly from Facebook; setting up a Shop section (if applicable to your business) is the best way to do this. 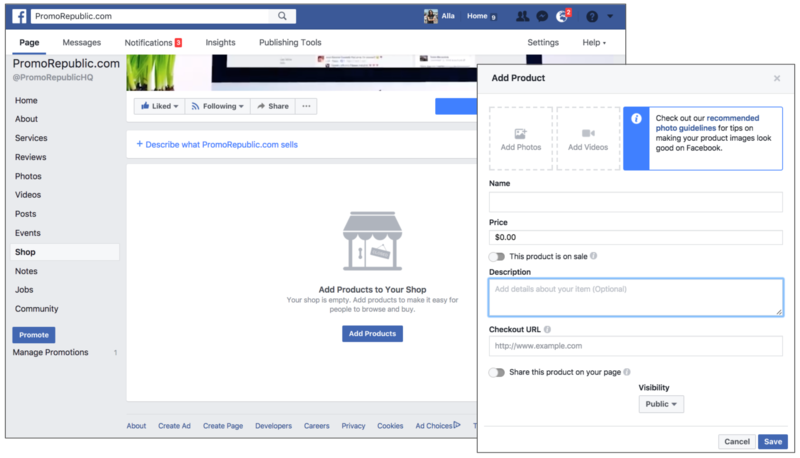 Go to the Shop tab to create your Facebook storefront. First step – agree to the Merchant Terms and Policies. 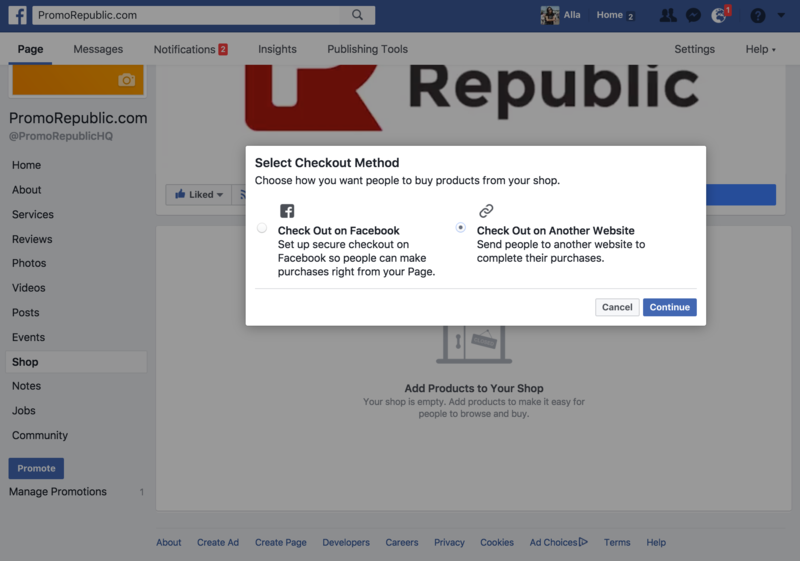 Next – choose your checkout method: allow people to purchase via Facebook or by navigating to your site when they click on a product. Now add products and describe them. 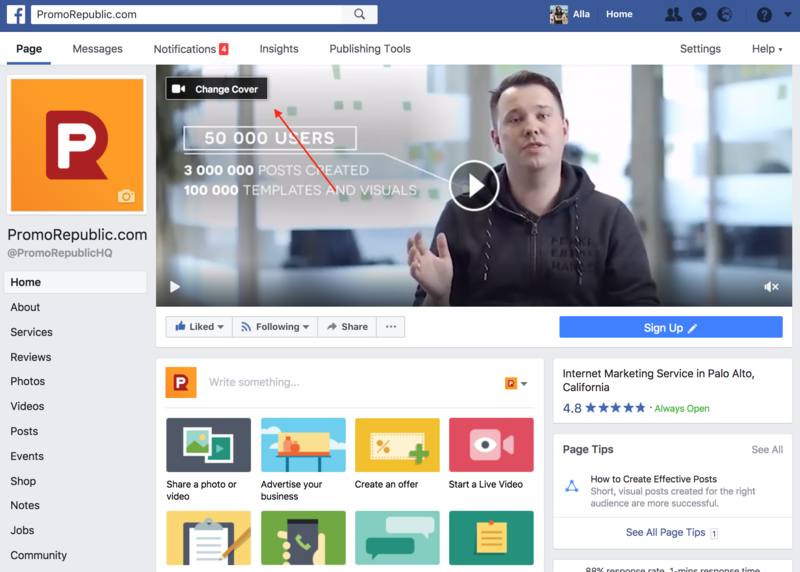 Now it’s possible to update your Facebook cover — with a video! 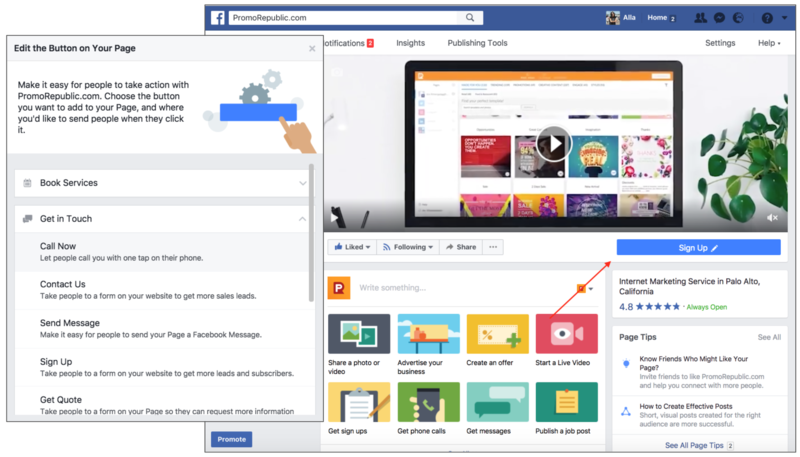 Once people visit your Facebook page, the video will start to play. 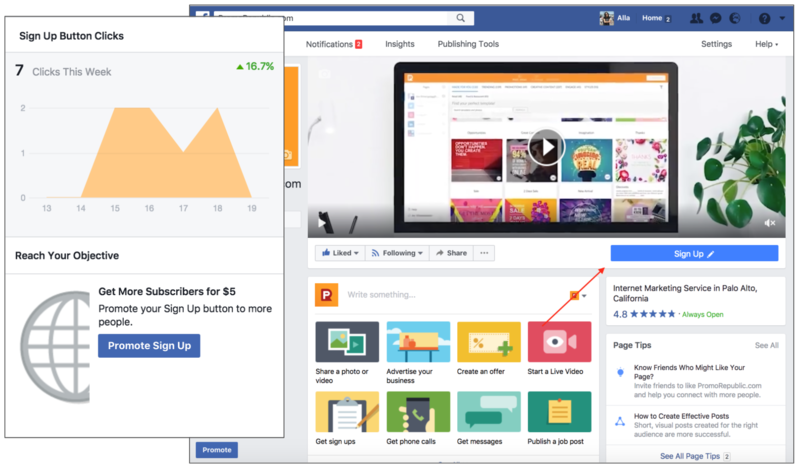 This will create a more dynamic page and more engaging interaction for your Facebook fans and followers. Messages are a way to build good relations with your audience. Some marketers neglect this hidden side of social media marketing. Why hidden? It’s a form of communication that occurs behind the news feed. When they see your promotional post, they don’t need to send you an email or contact you via your website to ask about your working hours, price, shipping etc – they simply tap on your profile and PM you. Instant Access to you – genius, really! 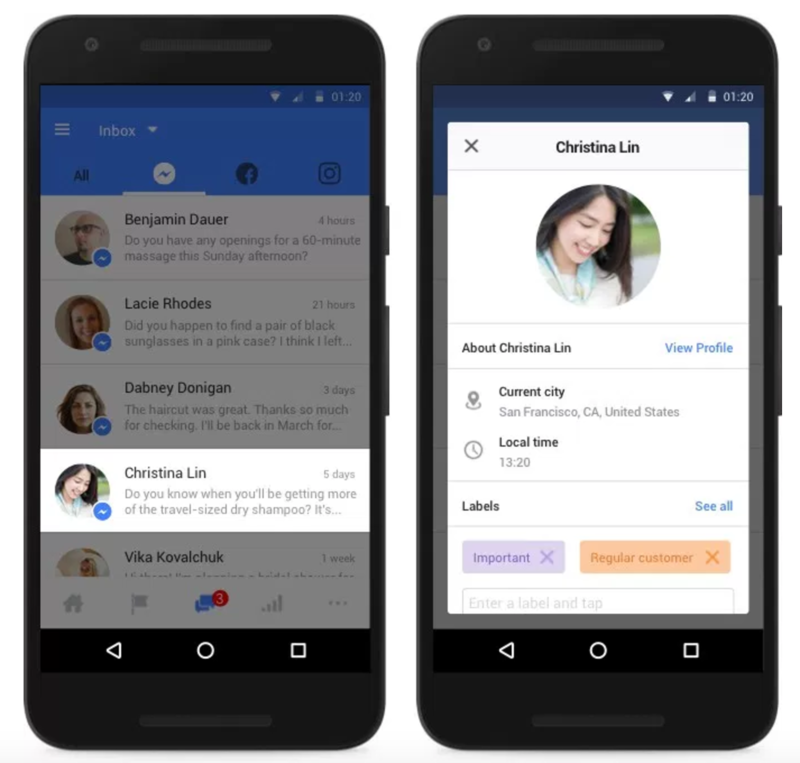 Facebook offers you pop-up instant messages if your response rate is higher than 90%. 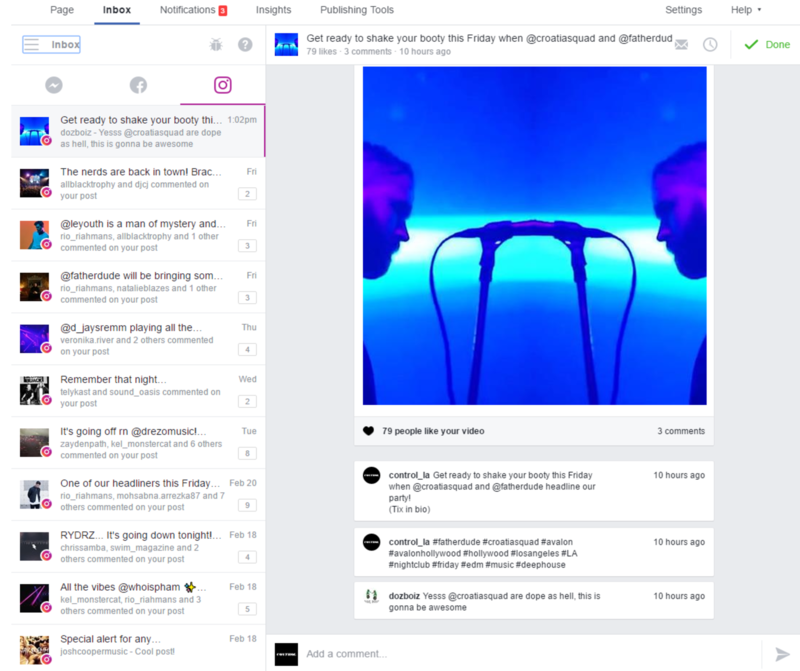 Seeing that you use messages so actively, the network pops a message in the feed to provoke visitors to ask business questions or simply start a conversation. 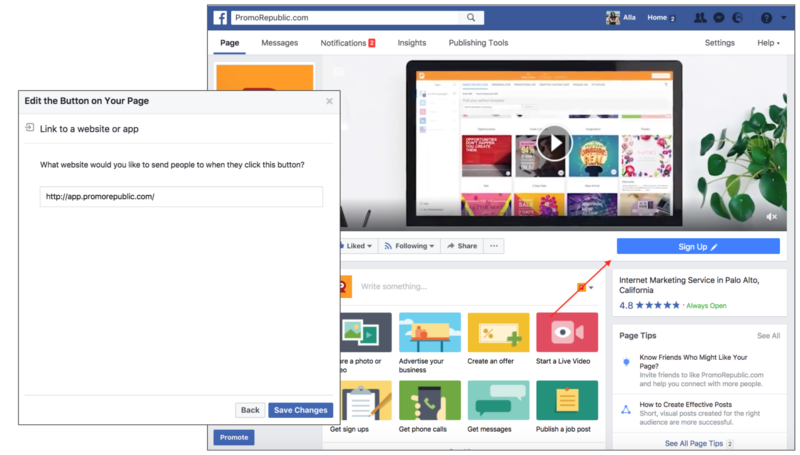 Make sure you respond instantly to keep this feature running on your page. Response time is IMPORTANT – instant replies let users know you care about them. Create a greeting that people will see the first time they open a conversation with you on Messenger. Save time by responding to all enquiries within a single Inbox: Messenger, Facebook and Instagram comments. Take a load off, now you know that you aren’t missing an important message or comment. To use updates, please download/update Facebook Pages Manager Mobile App (iOS, Android) or find the notification from Facebook on web version. Simply tap the person’s name to see their public profile, as well as their previous interactions with your business. You can also create your own labels and apply them to people based on what they messaged you about. You can reply to Facebook comments, visitor posts, reviews, messages and Instagram comments directly from the updated inbox by tapping on the content you want to answer. Online shoppers are influenced by reading social media reviews, comments and feedbacks. Studies say that 85% of consumers read up to 10 online comments and reviews before they can trust a brand. Hence the effectiveness with which you manage your comments could have a great impact on your business. Social media is about personal contact, and comments show your followers how important they, and their needs, are to you. Not only should you respond within an hour (at most, 2), you should ALWAYS respond. TIP: Use Facebook Manager Page Mobile App to easily manage all your messages, comments and posts (iOS, Android). You are the voice of a brand and the voice should always be a good representative of the company. As a brand, it is important to be absolutely transparent and not make it seem to the customer that the brand is trying to cover up for an error. The social media comments you receive can give you a lot of insight into how you can better serve your customers. 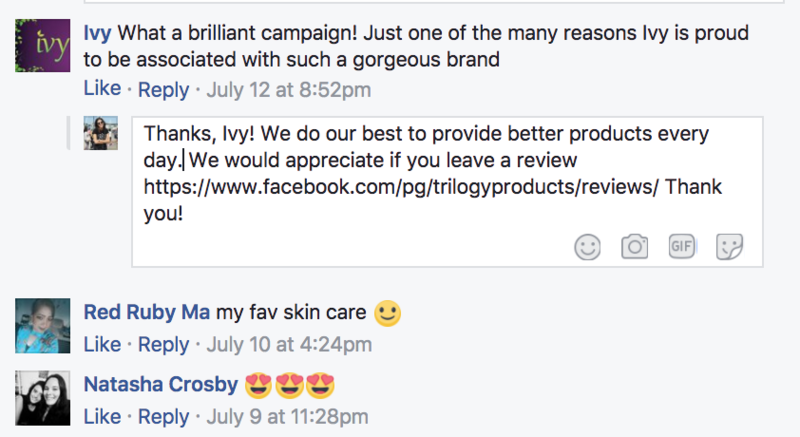 Never leave comments about product/service without sending a private message to the responder. Your lead is hot – now is the time to talk about your best offers, as long as you make sure to immediately resolve the problem the commenter may have had. To PM (private message) them, tap on the profile photo and choose Message. Don’t forget to advise them in the comments that you have sent them a PM. Where applicable, it might make sense to request the customer to leave a review. Make it easier for them by inserting the link to review your service in your comment. Always encourage your customers to come back and bring their friends along as well. When you don’t respond, you look like you don’t care. That makes people angry and they’re likely to leave even more negative comments. This hurts your brand. Always begin the comment with a polite and courteous apology. Sometimes frustrated customers may not give all the info that may be required to help sort out the issue. It may be prudent to take the conversation private in some cases. Odds are that people saw the post, and if it just disappears you look like you’re dodging the problem. Your community might want to get involved. There is no better proof of your brand’s likeability than fans and followers sticking up for it.